I've tried two peated American single malts recently, two whiskies whose characteristics couldn't possibly be any further apart. In my opinion, one is successful, the other is not. One half of me wonders if my palate has changed and that I'd have felt the opposite about them two years ago. Another half of me thinks I would have never liked the second whisky, ever. Another half of me was just happy to try them both at the same sitting. I first tried McCarthy's at Peatin' Meetin' two years ago and was underwhelmed by it. In hindsight, I'm pretty sure my palate had been blown out by bigger cask strength peated whiskies that day. I wanted to give it another try, in a quieter controlled setting. Last year, I gained a sample of McCarthy's from Jordan of Chemistry of the Cocktail in a sample swap. And I'm glad I did. McCarthy's is distilled at Clear Creek Distillery in Portland, Oregon. Owner Steve McCarthy buys peated barley malt from the Port Ellen maltings on Islay and has it shipped to Oregon. After it arrives, the malt is fermented by the Widmer Brothers Brewery. The resulting wash is distilled only once in Clear Creek's Holstein pot still. According to their site, the spirit spends some time in old sherry casks (though these casks may have been discontinued several years ago) as well as casks made from Oregon oak. They age it for three years. 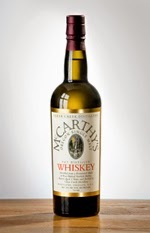 If you've ever tried to buy a bottle of McCarthy's you'll know why they don't age it any longer: each batch sells out quickly. For more details on their processes, please see Jordan's review or the Clear Creek site, both of which have a lot of good info. I'm uncertain which batch this was from. Jordan's review mentions that it may be somewhere between 2006 and 2008. Many batches have been at 42.5% ABV, one was "cask strength" at 49% ABV. This one was bottled at 40% ABV. The color is gold. The first thing I notice in the nose is the ocean. Is it the Atlantic or Pacific?! Then bacon, well charred bacon. Then cinnamon, brown sugar, and kirsch. The peat is rich, clean, and bright (if that makes any sense) as opposed to dirty or ashy. There's a nice vanilla bean note, maybe from the Oregon oak? Also some plum brandy (Slivovitz) to go with the kirsch. After being aired out for over 30 minutes, the whiskey releases a scent that reminds me of the white plastic siding on the house I grew up in (the Horseheads house for you insiders). The palate is loaded with applewood smoked bacon. The peat gets ashy here, though it gets brightened up by sweet mint. Sweetness grows with time, but it is kept in check by an IPA-style bitterness. More bacon in the finish. The beer that goes with the palate's bitterness shows up here. Then sugary cigar ash. And -- to continue the personal notes -- the air on Inis Mór, the rocky Irish island I got lost on eleven years ago. Some fresh fruits (apricots and apples) peek out into the nose. Lots of bourbon-like American oak notes too, caramel specifically. Then candied peat, apple mint, and tangerines. The palate gets sugary, toasty, and mossy. Maybe a little bit of green herbs and yeast. The finish is sweet and smoky. I can't believe this is the same whisky I tried two years ago. This further proves how different a whisky can be in separate settings. It's been a while since I've experienced multiple sense memory connections with a single whisky. Putting aside these emotional connections for a moment, I have no issue with this single malt's very young age. While there are distillate characteristics in the nose, they work very well with the big ocean, bacon, and beer notes. The sweetness stays mellow until water is added, the oak doesn't get too big, and the peat lingers at a medium level. While I prefer it neat, water doesn't wreck it, which is impressive considering the low ABV. But I cannot ignore those sense memories. I realize that you won't have the same connections, but they draw me more deeply into the drinking experience. Maybe you'll have your own. Or maybe you'll see this as a decent alternative to the other (imported) whiskies created from the Port Ellen maltings. In any case, McCarthy's shouldn't be dismissed by you peat fans. If young Taliskers and Caol Ilas ever get out of your price range, maybe you should look to Oregon next. From what I understand, the sherry casks were discontinued sometime in the early 2000s, so this should all be either new oak or refill casks from their own spirit. Good to know I'm not the only one who thought it was a bacon explosion. You could almost have this for breakfast. Sometimes I get some bacon notes from Caol Ila, but your bottle of McCarthy's had BACON notes; and not like the pink rashers the rest of the world serves up, but the brown crispy American version. Me likes. Clear Creek should revise their whiskey page regarding the sherry casks. I'll update my post, though. Thanks. It may be that things get tighter around Clear Creek now that they've been bought out by Hood River Distillery. In a lot of respects, CC was Steve McCarthy's hobby. That it ended up making money was, I think, something of a surprise. So it still has a something of a hobby feel, rather than the hyper competitive nature of a lot of more recent craft distilleries. I didn't realize that Hood had bought them out! Is it just me or does Hood seem to be one of those "distillers" that doesn't actually distill? Everything they sell seems to be from spirits that have been purchased. I don't think that they distill, which is perhaps why they bought CC. I liked their Pendleton 1910 12yo Canadian rye. McCarthy picks his fruit practically from their back yard, so it's not a bad match, on the face of it. "Brad’s dual role encompasses overseeing all sourcing activities for Hood River Distillers and directing the company’s return to distilling through the newly acquired Clear Creek Distillery." Oh boy. I'm hoping that they're not just going to use Clear Creek facilities to crank out $7 Monarch Vodka. It looks like rather than keeping on someone who has actually successfully run Clear Creek, they've brought in someone who has not. Do you know if Steve is sticking around? Or was part of the deal that he take the money and run? Steve is sticking around. What I've heard from the local distilling community sounds generally positive. My guess is that he was getting tired of the business side. He's been doing it for almost 30 years and is at an age where (semi)retirement seems totally reasonable. That sounds like good news. I do hope Steve will still be inspired to make a batch or two of the single malt before he fully retires or maybe hand it off to someone with skills. Man I really want to open my cask strength bottle now. That cask strength is still really surprising to me since the whisky appears to be the same age. I figure the angels are just more greedy in Oregon. We get sustained 85º+ weather here in the summer, coupled with relatively high humidity (especially during the rainy season), which should favor alcohol evaporation over water, so proof will drop pretty quickly.